With our Cool Promo Lite app you can launch a Facebook photo contest, a raffle or a campaign based on launching a single question to the participants. To install this application, you have to go to the “Your content” section and click on “Create content”. Select the Cool Promo Lite option. Name: It will be a name that will not be seen by end users and will only be used in your administration section so that you can easily identify the campaign (Example: Christmas campaign for the shop). Tab name that will have in Facebook: It will be used as the tab name displayed on your Facebook You can change it at any time, both from this section and from the Administration section of your Facebook page. Name of the campaign on Facebook: The name shown to users that visit your campaign. Campaign description: You can include some text that outlines your campaign. It should be explanatory enough for users to understand how the campaign works. Thanks to our editor, you can give styles (font colours, size, etc.) to your text (it is not mandatory, because we already give styles to the text that you include to make them look good). In addition to text, you can add images or, if you have the knowledge, HTML too. Google Analytics code: It’s only available for Cool Promo and Cool Promo White Label. Main image for the campaign: The image that you use to present the campaign that will be visible to all users. With Cool Promo and Cool Promo White Label you will be able to custom your promo much more. 2.1.3. Dates and configuration of entries. Campaign start date: The date from which your campaign will be visible on your fan page. If you have already installed the Cool Promo Lite application on your page (i.e., a new tab already appears in the Applications section), but your campaign has not yet started, we will show a generic message that says ‘No active campaigns‘ (unless you’ve chosen other text or images to use before the start of the campaign). Campaign end date: The date from which your campaign will no longer be visible on your fan page. After this date, we show a generic message like the previous one, indicating that there are ‘No active campaign‘. It is important to be careful when setting this date because once the campaign has ended, you may not modify it. Suggest your participants to like your Facebook page: It is no longer possible to make it obligatory that participants become fans of your Facebook page to be able to participate, but if that is what you want, you can recommend your fan page to them. This option is usually very effective, because users participating in your campaign generally want to keep up to date with the company’s latest news, or at least to anything related to the campaign or competition. Facebook page to suggest: Your can recommend your Facebook pages here. Enable public participation: All users can see who has participated. For competitions in which users need to vote on entries, this option must be enabled. If this option is enabled, there will be a link to access the list of all entries so far on the campaign’s main page. For each entry, the avatar and name of the user who has participated will be shown, as well as the text/image corresponding to their entry. Enable voting for entries: Activate the voting system for the entries in your competition. Users can view the entries and vote just once per entry. Do not forget to enable public participation in the previous option. Enable Terms and Conditions: Enabling this option will include a link to the terms and conditions for your campaign. In the preview, we can see what our campaign will look like on the Facebook page. It is possible to navigate to see how it will appear on different dates (before the start of the campaign, opening date for entries, etc.) and we can see the final setup of our entry form. Also, on the side panel, we can also participate in the promo as administrators or return to the editing page. 4. Publishing the campaign on Facebook. At this point, you will have set up your campaign, seen how it looks so that you can make the necessary adjustments. Now all you have to do is publish it. so you have to click on the ‘Publish’ icon of the promo or content that you want to launch and that you have previously setup. Select the Facebook page where you want to publish your campaign or competition. Choose how you want to publish your promo. You have two options: Standard or custom mode. 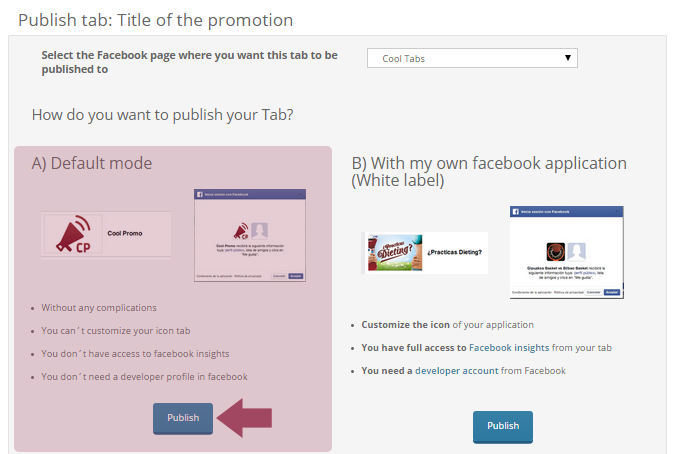 In this example, we’ll choose the standard mode, because the other option is for publishing a Facebook promo or tab with White Label. Once you have clicked “Publish” (may take several seconds to take out the action because we are communicating with Facebook to post your app), your Cool Promo Lite be perfectly installed in the selected page. It’s that simple. Once payment is made, our campaign is active. Now users can already see the campaign in your Facebookpage (provided that the campaign start date is before or equal to the current date).